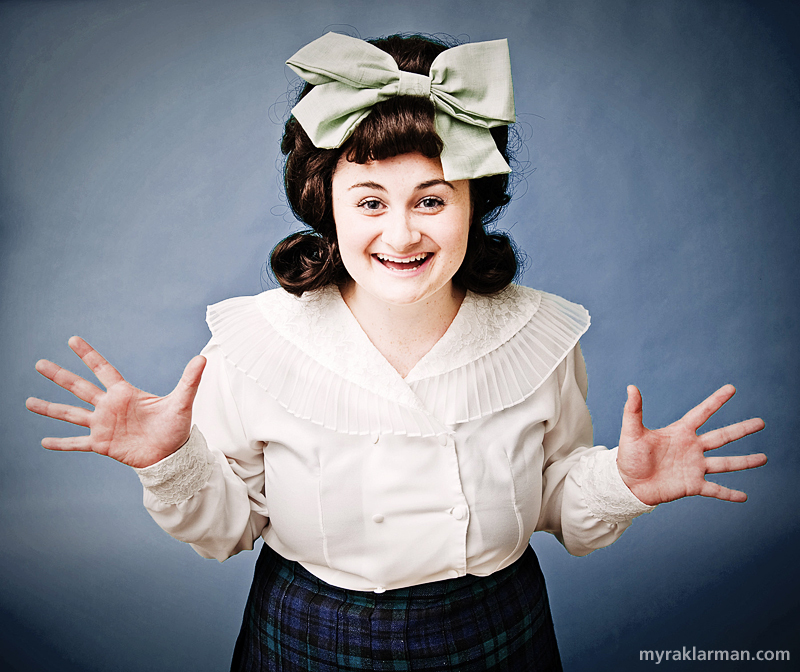 Outsider Tracy Turnblad (Grace Gilmore) dances her way to stardom on local daytime TV! 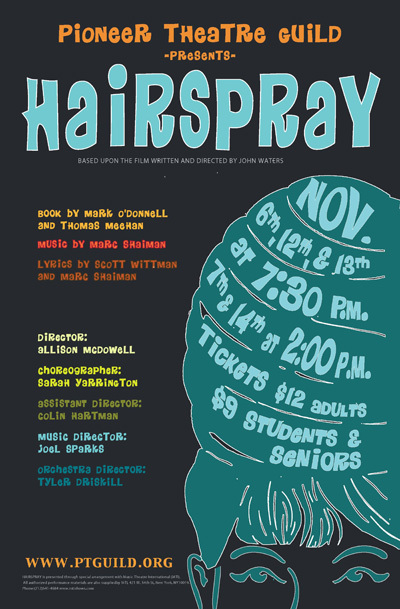 Earlier in the month, a handful of Hairspray characters from the Pioneer Theatre Guild’s upcoming musical came to my studio to collaborate on some tasty, leaving-me-wanting-more publicity photos. As usual, I was blown away by the talent and energy of the kids, and how perfectly each was suited to his or her part. Of course, I would have loved to have included Edna Turnblad (Tracy’s super-plus-sized mother, played by a male in drag) in the shoot. But that’s a “feast for the eyes” best experienced with 1000+ other theater lovers when he/she first appears on stage — I CAN’T WAIT! Assigned seating now on sale at showtix4u.com. General admission seating on sale at the door. 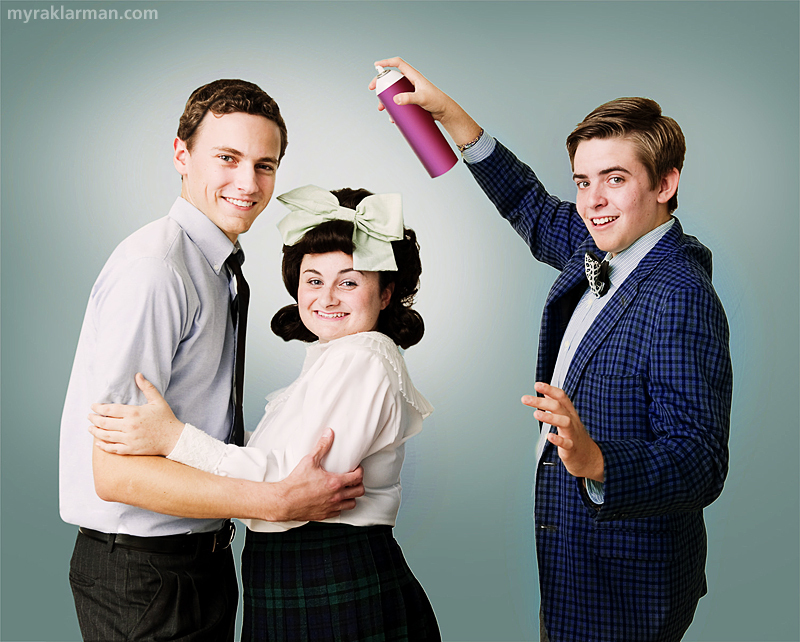 Teen heartrob Link (Robby Eisentrout) with Tracy Turnblad (Grace Gilmore) and TV host Corny Collins (Schuyler Robinson). L-R: Seaweed (Tre Brown), Tracy (Grace Gilmore), and Lil’ Inez (Maimouna Jammeh) are ready to help integrate Baltimore. L-R: Link (Robby Eisentrout), Tracy (Grace Gilmore), Corny Collins (Schuyler Robinson), Lil’ Inez (Maimouna Jammeh), and Seaweed (Tre Brown). I loved Russel in drag he was hilarious! It Is a true test of man hood to be able to play a convincing girl. More boys should play girls as well as Russel did. All of the other actors and actresses were amazing! All of u deserve to go to new york's performing arts school u r that good! I love going to see how good the new plays r and u guys never disappoint!